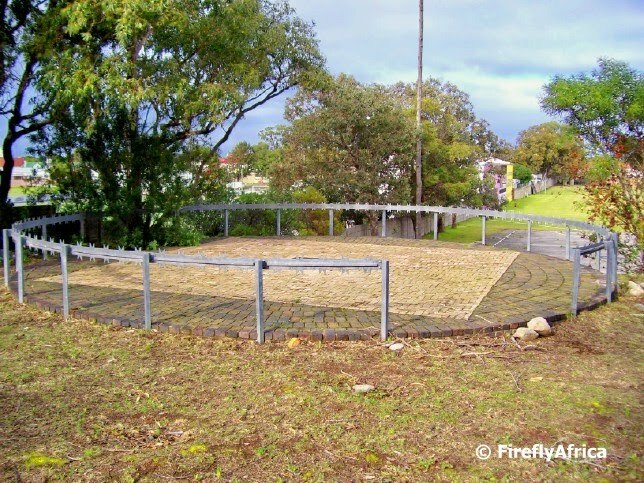 Kemsley Park next to the SAP sports fields just off Mount Road was one of two Anglo Boer War concentration camp sites in Nelson Mandela Bay. The other one is situated just outside Uitenhage. 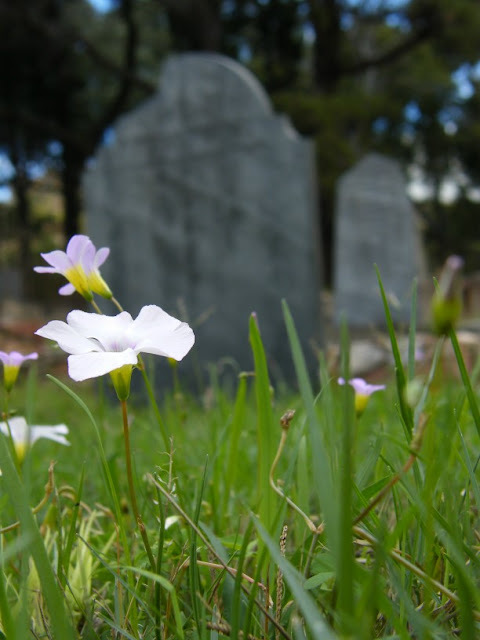 Roché Petersen has pointed out to me in a previous post that the dead from the concentration camp was buried in the North End Cemetery where there also is a memorial. I haven't had a chance to pop by there to check it out, but hope to do so soon. 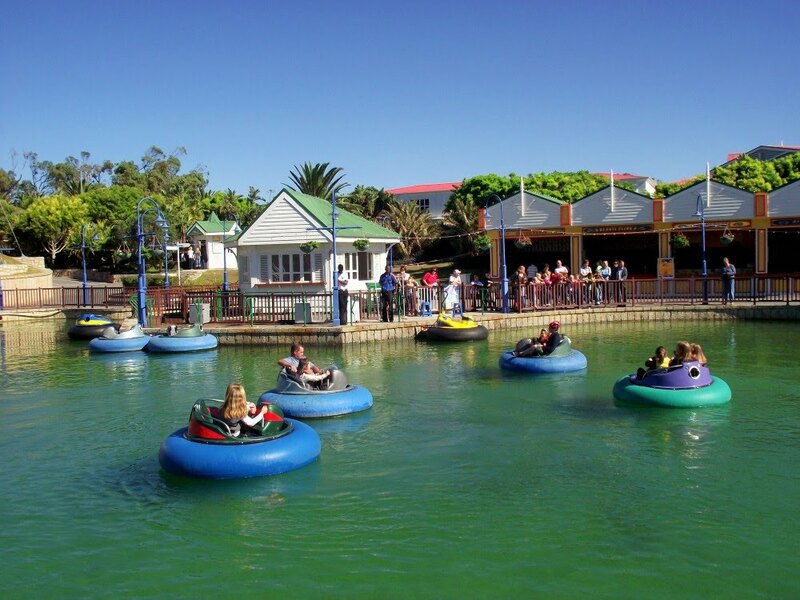 The Port Elizabeth Harbour is used by commercial boats, fishing boats and recreational boats (yachts). 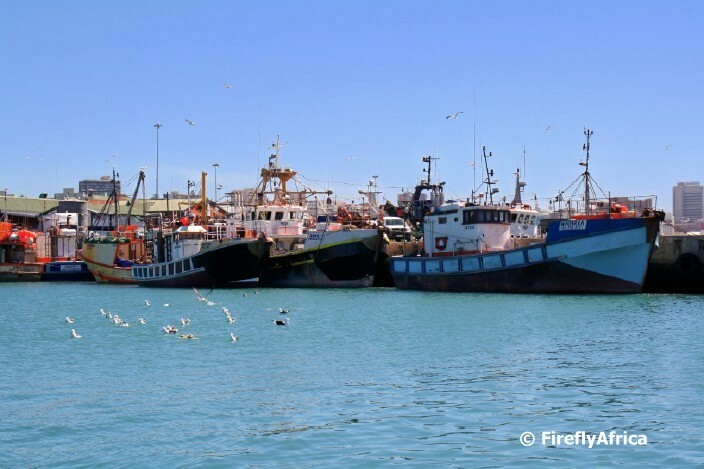 People normally associate fishing with the small harbours along the South Western Cape and West Coast, so PE doesn't get seen as much of a fishing harbour. But that is where they are wrong. It does have a huge number of fishing boats that are based here and that offload their catch at the fishing facilities. Most of the catch gets processed here so you wouldn't buy the fish fresh off the boat like in the Cape, but you can get fresh fish at some of the outlets on the harbour. 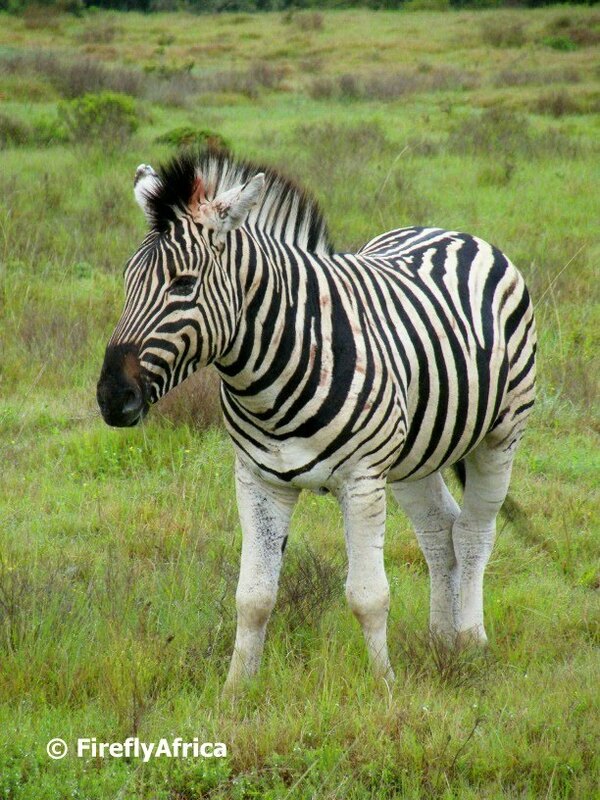 The Burchell's Zebra is quite common in the Eastern Cape and the majority of game reserves would have them. Have you ever wondered if a Zebra was white with black stripes or black with white stripes? How do you differentiate between a male and female zebra without turning them upside down and looking at the obvious? The males are black and white and the female are white and black. 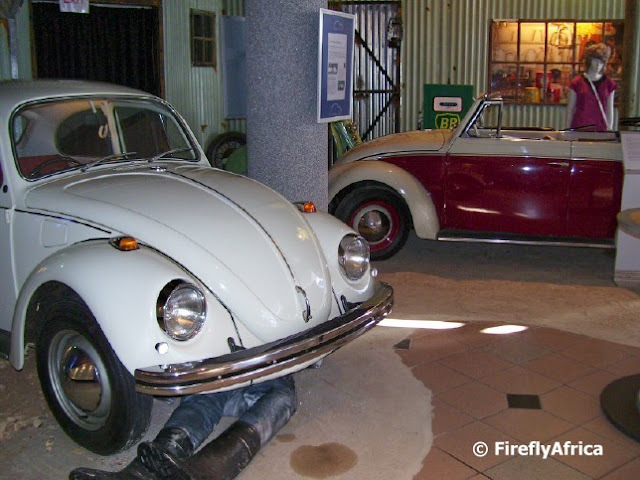 One of the exhibits at the VW AutoPavilion in Uitenhage featuring two Beetles. The scene depicts the two vehicles in an old workshop. I love the legs wearing gumboots sticking out from under the closest one. 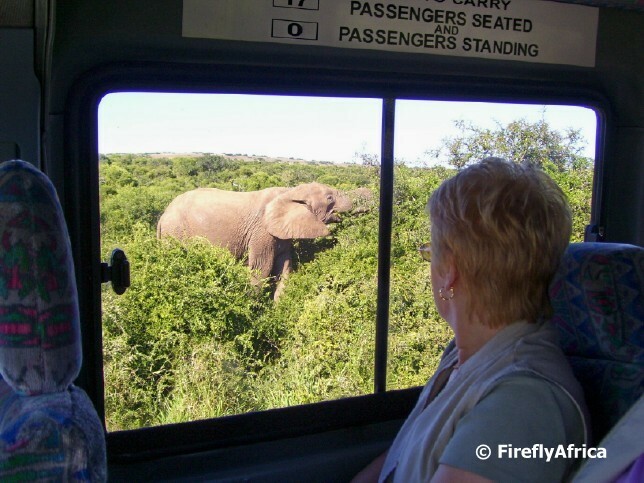 Addo Elephant National Park is probably the most popular destination as a day trip out of Port Elizabeth. Visitors can either go to the park in their own vehicles or with a tour operator. Once at the park you can drive through the park in the vehicle you came in as it is a national park, or you can book an open vehicle game drive guided by a game ranger. In the days when I was still a tourist guide I used to go to Addo quite often. At one stage I was there at least 5 or 6 times a week. Here is a tourist busy elephant viewing from the comfort of an air conditioned bus, which was quite handy on a hot and dusty day. The rugged coastline at Schoenmakerskop looking west towards the village. 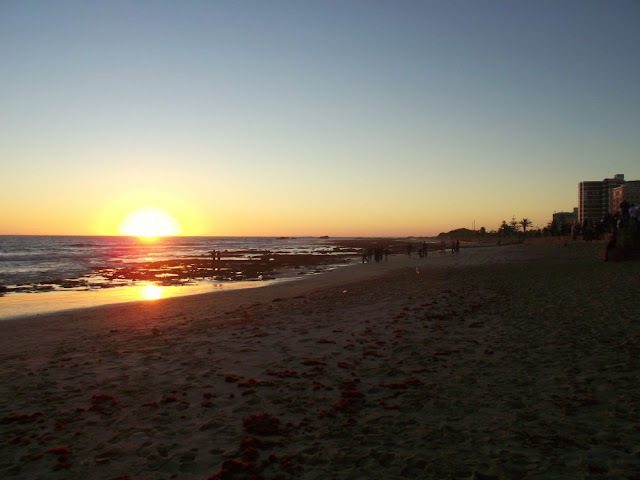 Schoenies is situated on the southern coast of the city and even though its referred to as a village, its a suburb of Port Elizabeth. I have a special places for Schoenies as I worked in the Sacramento Restaurant over weekends for 5 years. This is where I met the Damselfly, but thats a story for another day. I haven't spent much time there lately so I get my Schoenies kicks through Luc Hosten's photography on the Friends of Schoenmakerskop Page on Facebook. 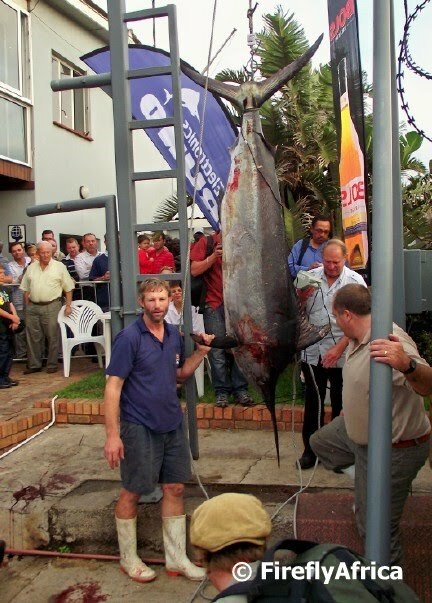 Late last week the annual Algoa Bay Tuna Classic took place from the Port Elizabeth Deep Sea Angling Club in the PE Harbour. The winning catch in this year's competition was a 83kg yellow fin tuna caught 26 miles from the harbour by local fisherman Ruvaan Palm and his team on board the Seriola. In the picture is Brian Webb from the boat Tempissed with a 119.5kg marlin caught on the same day as the winning yellow fin tuna. On Friday the Newton Park Primary School had an event to get their pupals into the 2010 FIFA World Cup spirit. The school created a soccer ball float which was put on a trailer behind the school combi. 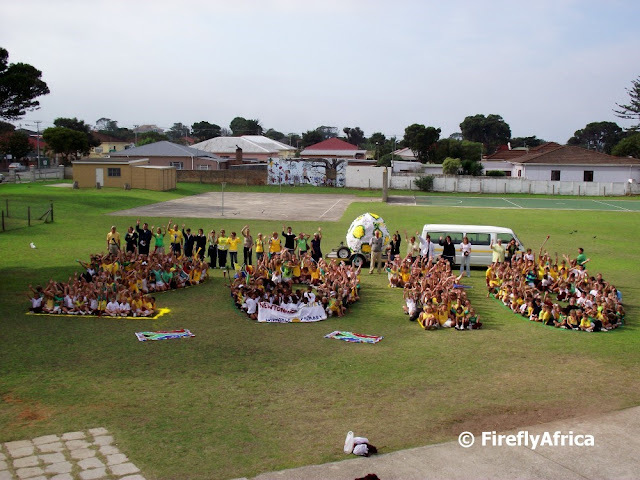 All the children were encouraged to wear their Bafana Bafana (the South African national soccer team) colours and vuvuzelas and got together on the sport field in the shape of 2010. From here the procession wound its way through the streets of Newton Park to the school's main sports fields where they had all kinds of festivities. 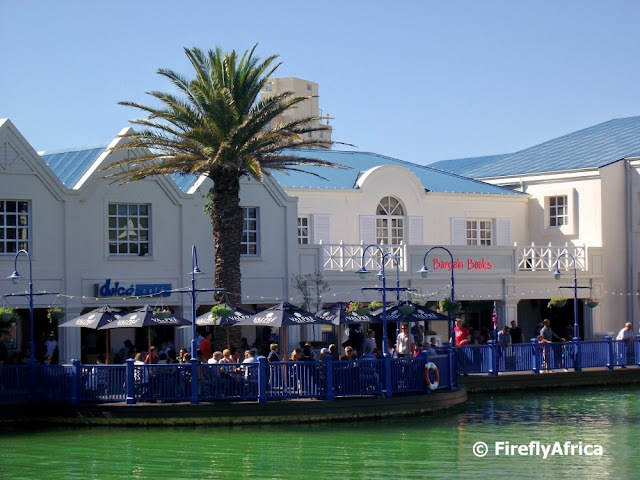 On a nice sunny day one of the best places to have lunch or just a coffee or a drink is one of the outside seating areas belonging to the restaurants at the Boardwalk. Its normally quite difficult getting an outside seat overlooking the Boardwalk lake at a place like Dulcé. Suddenly I wish I was sitting there and not here in front of my computer. 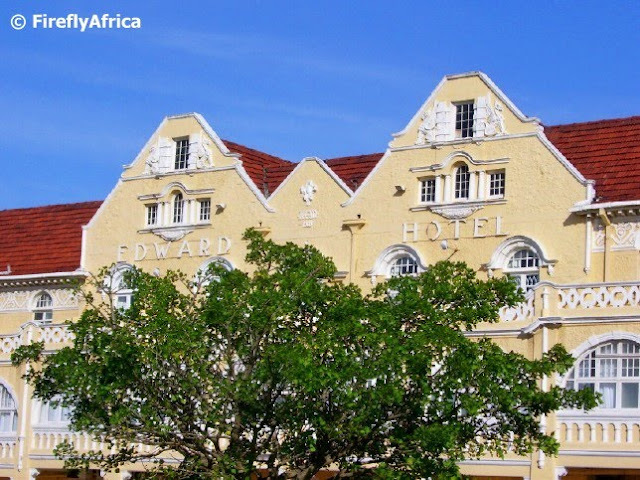 The King Edward Hotel in Central is situated across the road from the Donkin Reserve. Established in 1903, the hotel started out as the place where the who's who of South Africa stayed in when visiting Port Elizabeth during the early 1900's. The hotel was sold do a Dubai based group a couple of years ago and is now busy being upgraded to go back to its former glory. I spend a couple of days in Durban last week taking part in the annual Tourism Indaba. 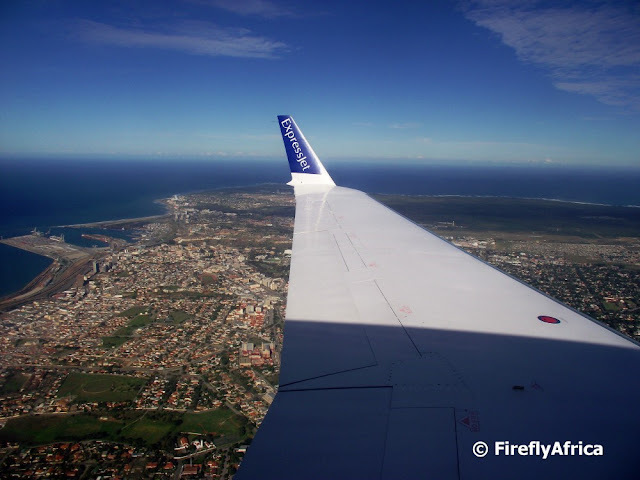 On the way back I had a window seat for a change (I prefer an isle seat and normally get one) and wanted to take some photos of Port Elizabeth as we were coming in. For some reason I was a bit slow to get one of the main beachfront (I was probably admiring the view too much), but got this one as we were crossing town to come in for a landing from the west. I was sitting on the wing... well not literally on the wing... so had to include it in the shot. For more pictures of and from the sky, visit Skywatch. There is just something majestic when you see a giraffe. Tall and graceful and extremely photogenic. I took this photograph at Seaview Game and Lion Park just outside Port Elizabeth. Did you know? 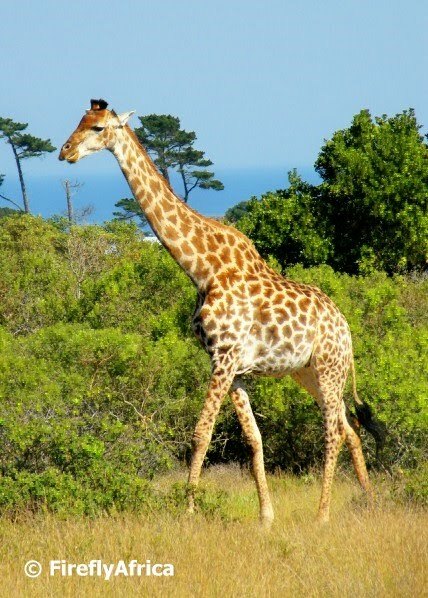 A giraffe has seven neck vertebrae. The same amount as a human. I wonder why I can't see over a six foot wall. The narrow gauge Humewood Station has been in the news lately because of its rundown state. 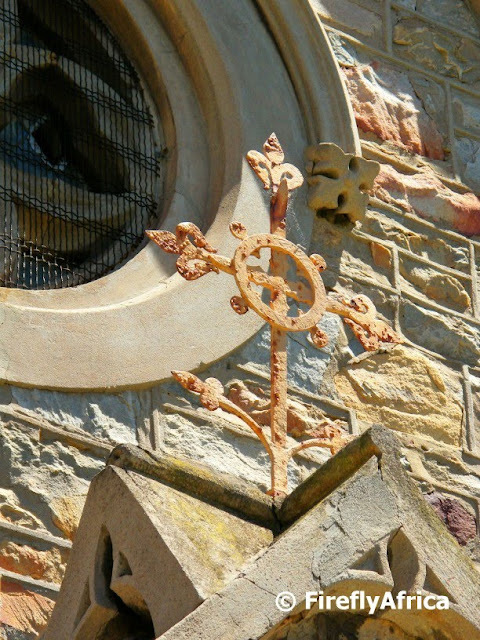 Although it always have had a bit of "character", it has deteriorated of late and fell into disrepair. Spoornet has now decided to demolish all the old structures on the property and to clean it up. I don't know if they have any plans to redevelop another station (for the Apple Express to use), but anything will look beter than what its been like. I've been wanting to go there for a photo shoot but just haven't had the time. If I don't get there soon I may never get the chance. 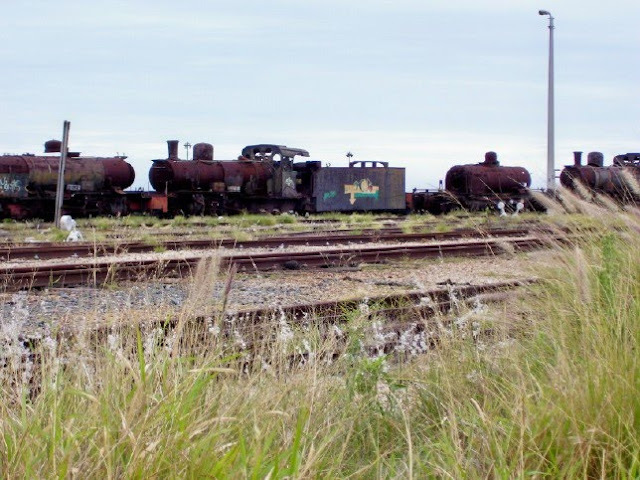 This pic of the old rusty engines and rolling stock was taken from the sidewalk along Beach Road and is probably the closest I have been to it all. I have said so before and I will say so again. The guys of the National Sea Rescue Institude does an awesome job and often doesn't get the credit they deserve from the public. But I am having one of those everything gets critisesed and no credit gets given mornings, so I won't go into this. 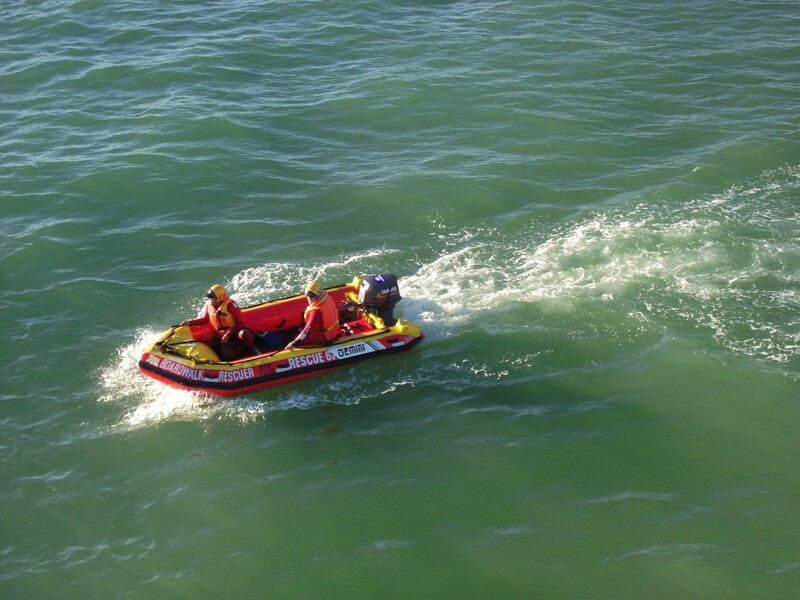 I took this pic of two of the NSRI guys on their small rubberduck from Shark Rock Pier at the recent Ironman South Africa competition. 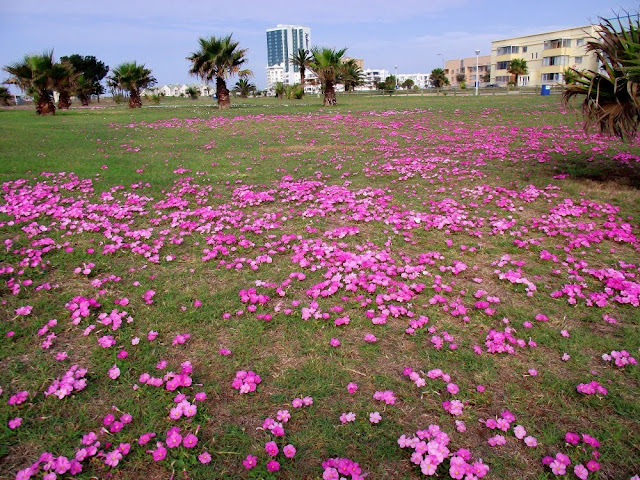 The Seaview Game and Lion Park is situated just west of Port Elizabeth. They have a white lion breeding program. The lion cubs are all hand reared by the staff who give them their bottles, sit up with them at night and even take them potty. Ok not potty. In their case its lawny, or grassy or sommer behind the bushy. LOL. Why I say that is that when a cub is small the mother would lick their thingies (for a lack of a better blog friendly word) to make them weewee. The staff would take them out and tickle their thingies... 'Nuff said. 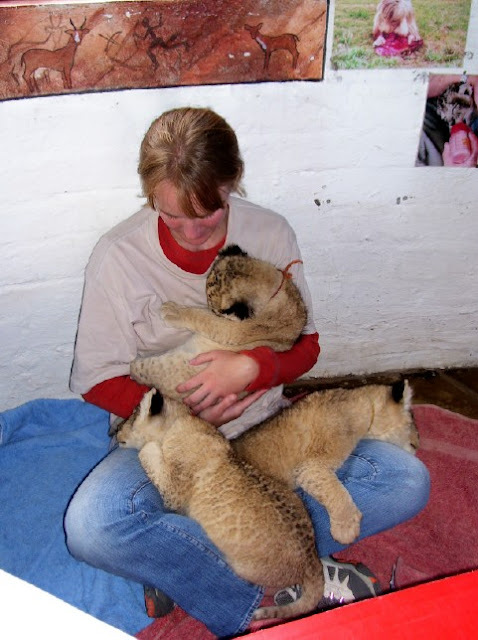 Here one of their international volunteers are cuddling a couple of lion cubs just after feeding time. These cubs may not be white, but they have the white lion gene. 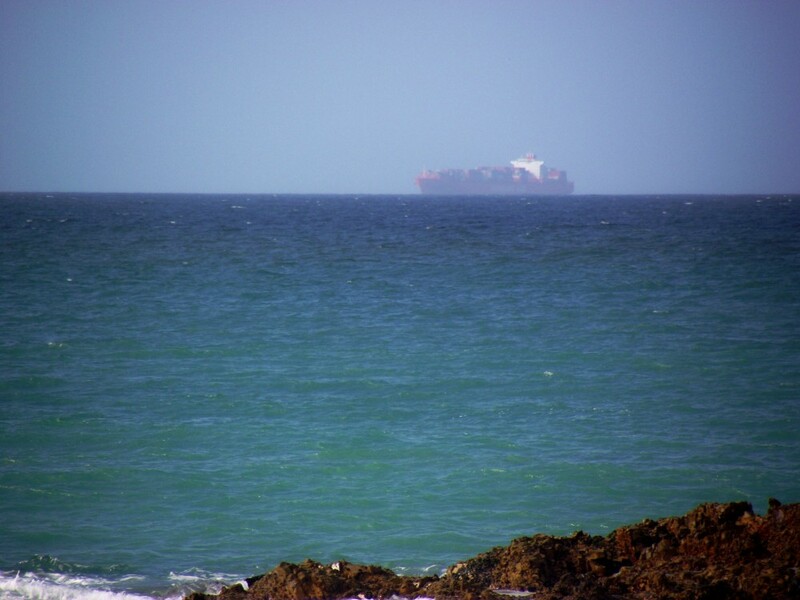 This container ship sailing into Algoa Bay towards the Port Elizabeth Harbour looks just like a phantom ship in the haziness of the other day. 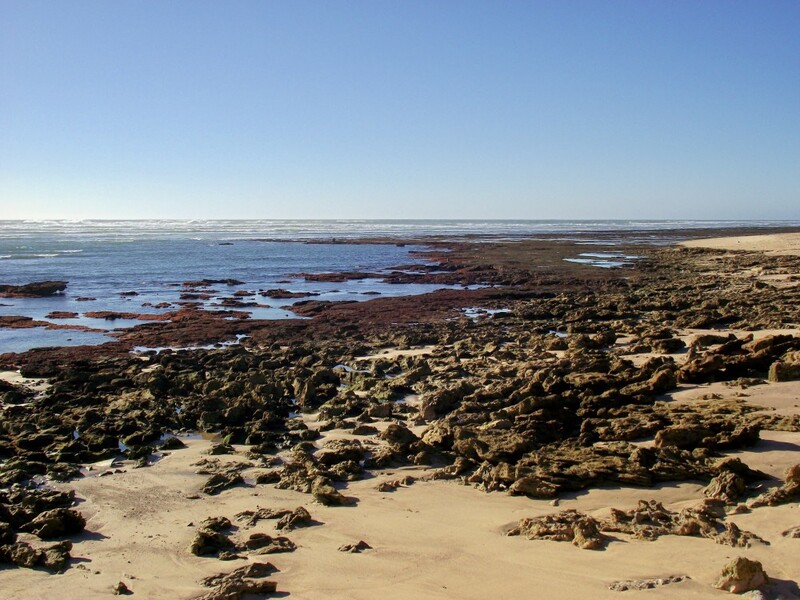 The area between Pollock Beach and Cape Receive is generally known as Flat Rocks. The name refers to the rocks stretching out to sea at low tide. The rocks are easily accessible and is very popular fishing site. Some of the older Port Elizabeth followers will remember the old Flat Rocks Roadhouse which was situated overlooking the sea across the road from the Humewood Golf Club entrance. The roadhouse of cause is no more. I remember the roadhouse, but I don't have any real memories of us going there with my folks when we were kids. A little while ago we went to the giant sand dune at the Maitland River Mouth. 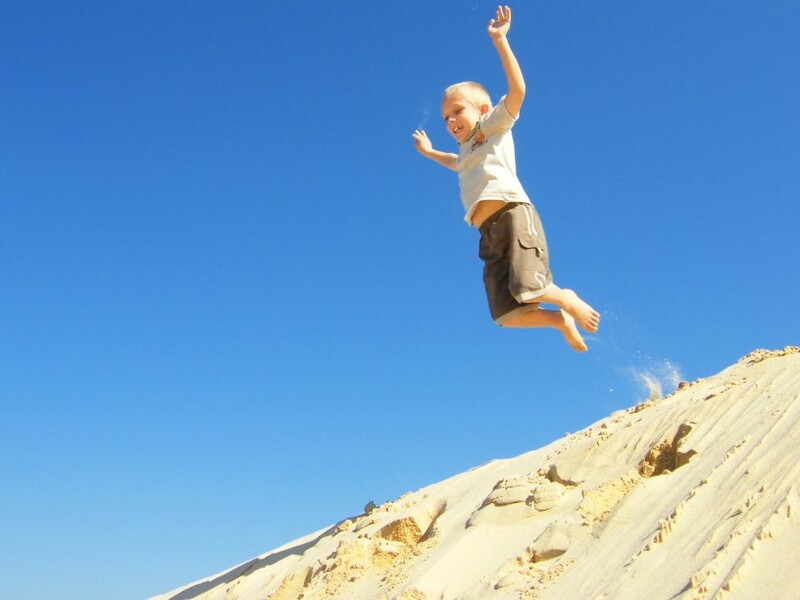 I climbed to the top with Chaos Boy and on the way down I experimented a little bit with him leaping into the air. If you enjoy looking skywards, visit Skywatch Friday for more sky pics. 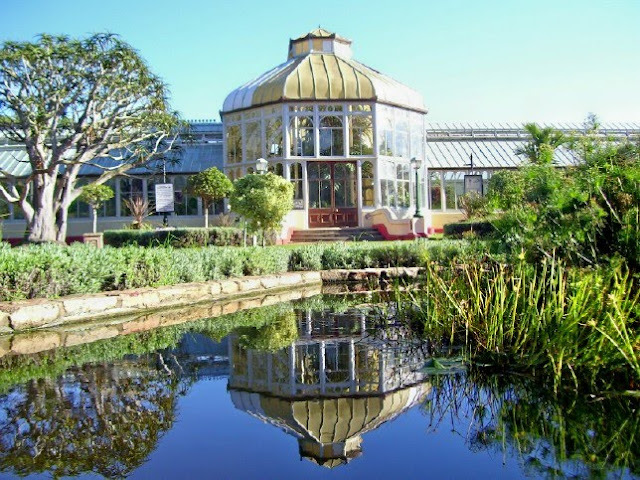 The Nelson Mandela Bay Municipality are currently restoring the historic Pearson Conservatory in St Georges Park. The 128 year old conservatory was opened in 1882 and has been in need of major renovations for a couple of years now. Its been very sad to see the building fall into near disrepair, so I was elated to hear the news. I remember playing around there as a child while my mom was manning her table at the monthly Art in the Park. The conservatory always had some many different kinds of plants and flowers and there was always a little artificial stream flowing through it. I can't wait to see the end result. This picture was taken a little while ago and obviously the building isn't looking like this at the moment as most of it has been taken apart for the renovation. To read the Herald article on the reservation, click here. 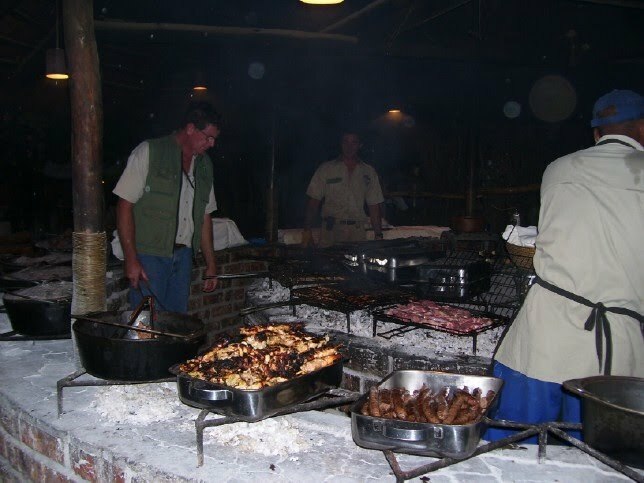 Most of the private game reserves around Port Elizabeth serve traditional South African foods to their guests. Some make it in their kitchens while others do it out in the open on the coals. At Schotia Safaris they prepare the food in their outside lapa in full sight of their guests. Schotia's owner, Peter Bean, are very hands on in everything that happens on the reserve and in the picture he is braaiing (barbecuing) the lamb chops, chicken sosaties (kebabs) and boerewors (farmer style sausage) that is served as dinner. The lawns along Marine Drive between Hobie Beach and Pollock Beach is currently covered in pink flowers. Driving along the path at Lovers' Lane one would think that spring somehow got stuck here. The big building in the background is the 5 star Radisson Blu Hotel. The Ron Belling Art Gallery on Park Drive is one of my favorite galleries. Ron Belling was a military aviation and marine painter. A great percentage of his paintings were painted with historic Port Elizabeth as background. Belling was a self taught painter and perfected his art and became one of the foremost (if not THE foremost) military aviation painters in South Africa. 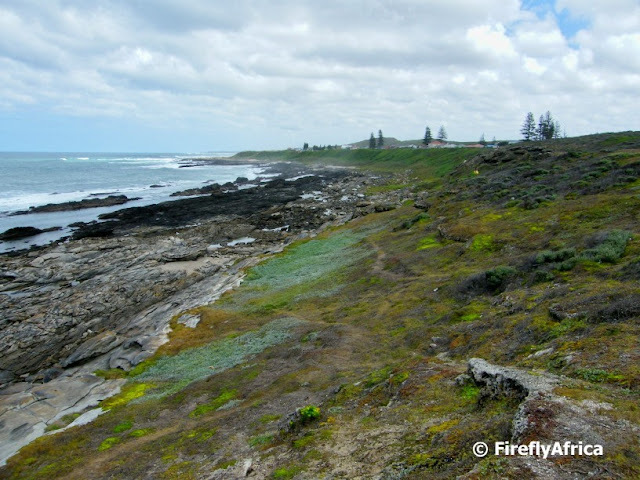 The South African Marine Rehabilitation Centre, SAMREC runs a rehabilitation centre at Cape Recife to care for the sick and injured Marine Life of Algoa Bay and neighbouring coast line. 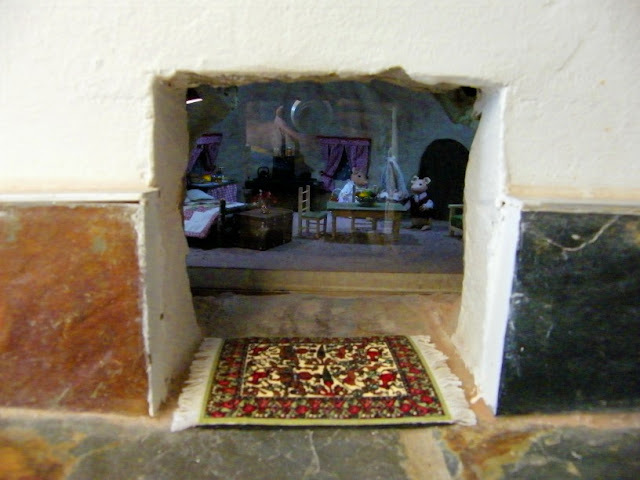 They run educational programs at the centre and one of the features that the kids love the most is the Mouse House. The Mouse House was built in recognition to the wild mice that had to give up their homes in order for the centre to be built. The best part about winter is that you don't have to get up as early as in summer to get a decent sunrise picture. Only problem is that even though its later, its cold and dark when you get up. This is sunrise at Hobie Beach taken about a week or so ago. 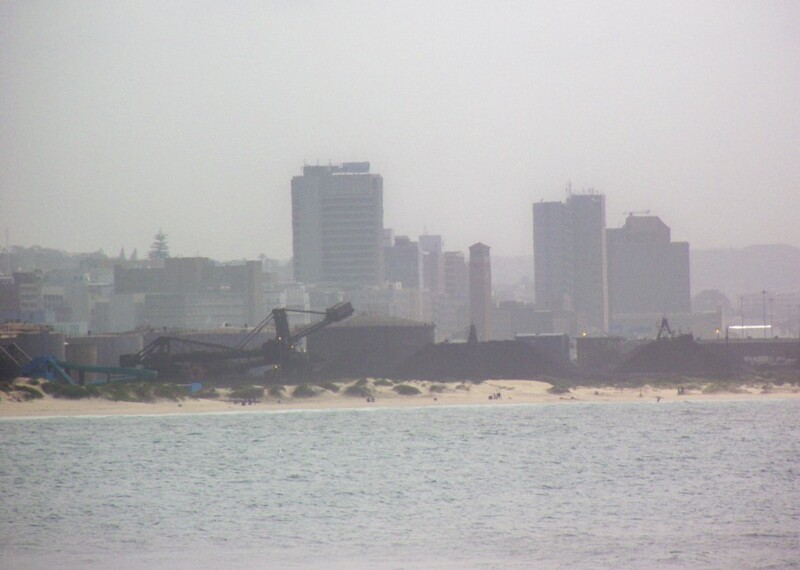 I had to pop down to the beachfront the other day and got this shot across the Bay towards a hazy city centre with the tank farm and manganese ore dumps in the foreground. There was an article in the newspaper this morning about one of the younger big elephant bulls in Addo Elephant National Park killing one of the older ones. It made me go and have a look at my elephant pictures to see if I had a nice picture of an elephant bull. I found this one that was taken a couple of years ago when I was still tour guiding. We were in Addo in a 11 seater minibus which I was driving. This big bull came walking down the road and headed straight at us. He showed no aggression, but also no intention of leaving the road. Thus leaving us right in his way. When my reverse lights came on the cars behind me saw that they had to get out the way and scattered. I made sure I stayed far enough in front not to irritate him. After a minute or so he changed direction and mozy'd off into the bush. While I was reversing the tourists in the bus was clicking away and this pic was sent to me by Paul Settle of the UK. 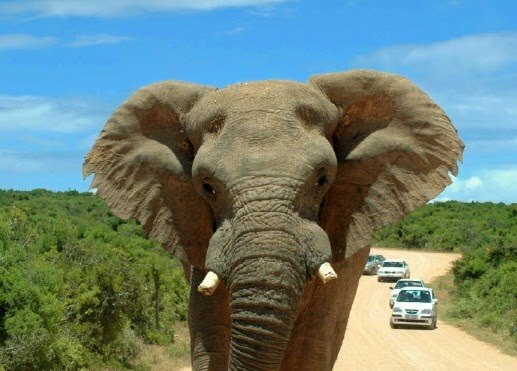 As a large group of tourists watched in horror a young elephant bull killed an older one in a fight at the Addo Elephant National Park last Thursday.Mandy Roets, marketing manager of SANParks' Frontier district, said Paul, a bull in his 30s, impaled the brain of Skukuza, 47, with one of his tusks. Tourists saw Paul chasing Skukuza, who only had one tusk, around the park throughout the afternoon. "When Skukuza fell down, Paul dealt the death blow by piercing Skukuza's brain with his tusk. "While it's an upsetting event to watch or hear about, we have to accept it because it's part of the animals' natural behaviour," said Roets.Skukuza was one of eight elephants which were relocated from Kruger National Park to the Addo Elephant National Park five years ago.Paul - also from the Kruger Park - arrived at Addo a few months after Skukuza.The eight elephants were specifically chosen for relocation to improve the quality of the gene pool at Addo.Skukuza's right tusk was damaged during the journey to his new home, and he lost it shortly after he arrived at Addo. "Skukuza was peaceful and never showed any signs of aggression toward other elephants or tourists. "Unfortunately Paul is at the stage where younger males challenge older males in an attempt to gain dominance. "It happens most often during mating season, when elephant bulls can act aggressively toward one another." One of the activities at the Boardwalk for kids (and sometimes big kids as well) is bumper boats on a separate section of the Boardwalk lake. The Rugrats went to a birthday party at the Boardwalk the other day and one of the things they did was the bumper boats. Chaos Boy is a bit scared of water and Drama Princess is still too young to go alone, so I went along with them. The boats have little water canons which meant that I came off the water soaked. 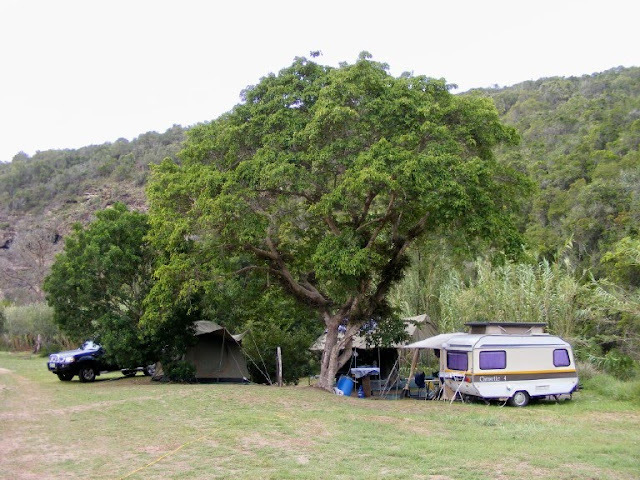 I really enjoy camping at Sleepy Hollow just outside Port Elizabeth and have done so a couple of times now. Its the perfect getaway from the city and only about 20 minutes away. It gives you the opportunity to get back to nature with the main thing you can do being going for walks up the valley. These campers were a group of friends that were camping just below us during our last stay.